Considering buying a Beerbox? | Because beer. I fell down an internet wormhole recently and found myself looking at the Beerbox from Brewing Tools. It’s a ~2 gallon plastic keg that you can fit in your fridge and pressurize with a hand charger. For $199 you get a charger, 2 beer boxes, and some co2. At first glance it seems like an easy way to get in to kegging, but not a particularly cheap way. The plastic (HDPE?) box will be difficult to sanitize, and it will definitely require replacement at some point. You probably can’t force carbonate in it, and those co2 cartridges are much more expensive than a bigger tank. I think if you want to go cheap, you should actually go cheap. The Tap-a-draft is less than half the price AND is clear so that you can see if it is clean when you are washing it. This kit from Amazon is $75 and comes with 3 6-liter bottles (4.75 Gallons) This would be my recommendation if you are super price sensitive. Even $100 is pretty expensive for something that you will end up having to recycle at some point, and the resale value of those kits is pretty low. I wonder how much more it would cost for a long term solution? After thinking about that for a bit I decided I’d put together something comparable and see what the price difference was between something plastic (beerbox) and Stainless. 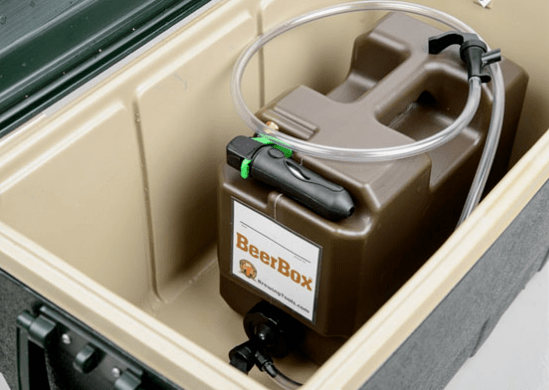 I’ll use the same style co2 charger as the beerbox ($18.99), and add a keg disconnect ($5.99) so that you can get the co2 into your keg. Lastly, you’ll need a way to get the beer out of the kegs! This is a picnic-style faucet and keg beer line disconnect. $13.54 once you make it pin lock. For $48 less than the beer box you can get FOUR stainless steel kegs. You can sanitize those with scrubbing, chemicals, or heat AND when you’re done you can sell them back for what you paid! The one downside is that these kegs come used, and they generally have a little bit of soda syrup in them. 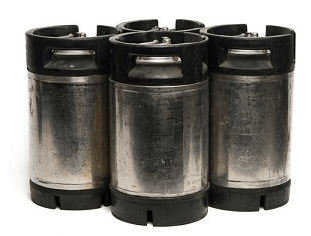 It takes about 10 minutes per keg to wash them out, swap the seals and sanitize them. If that doesn’t put a nail in the Beerbox, I don’t know what else you want.